Who Needs a Visa to Enter Belgium? How to Apply for a Belgium Visa? Where to Apply for a Belgium Visa? The Western European country of Belgium, officially known as the Kingdom of Belgium, is home to 11,420,163 residents. Its capital, Brussels, is among the largest and the most densely populated Belgian cities. Different parts of today’s Belgium have been ruled by the Dutch, Spanish, French, Austrian, which have left behind a rich history and architecture. The country is distinguished by its canals, cobbled streets and medieval buildings. Some of the favorite tourism attractions in Europe are located in Belgium, as the spectacularly beautiful medieval city of Antwerp, the Archaeological Museum of Arlon, the Flemish béguinages, the fairytale-like ancient city of Bruges crisscrossed by canals, and much more. In 1995, the government of Belgium signed the Schengen Agreement, thus joining the European border free area. Today, short-stay entry to Belgium also enables one to travel to the rest of the Schengen member states as well, which includes a great share of Europe. In 2017 alone, the Belgian embassies around the world received 231,437 short-stay visa applications to Belgium. A visa – if you are subject to Belgian visa regime. *British passport holders are exempt from the criteria of passport validity and issuance date. You may also be asked for other supporting documents such as an invitation letter by a Belgian host, proof of lodging or a round-trip ticket. For more information in this regard, contact the local consular services of Belgium in your home country. What is your purpose of visiting Belgium? How long do you intend to stay in Belgium? Where are you going to stay in Belgium? Etc. Upon checking your documents, the Belgian border officer will give the final decision whether you should be permitted to enter Belgium or not. If everything looks okay, you will be allowed to enter Belgium, and thus the Schengen Area. Please, make sure that the Belgian border officer gives you an entry stamp in your passport when you enter the Schengen area. Without a stamp, you could be fined or detained from Belgium. Who Needs a Schengen Visa to Enter Belgium? A citizen of a third-world country that has reached a visa liberalization agreement with the Schengen states, but you were rejected from entering Belgium or any other Schengen country visa-free. What Type of Visa Do I Need to Enter Belgium? Belgium Airport Transit– if you need to transit through one of the Belgian airports, to reach your travel destination country, outside the Schengen Area. Find out if will need a Belgian Airport Transit visa. Belgium Tourist Visa – for visitors who wish to spend their vacations in Belgium, or that want to come over for sightseeing and exploring. Belgium Visitor Visa – for foreigners who have family members or friends residing in Belgium, and wish to pay them a visit. Belgium Business Visa – established for businesspeople that want / need to participate in activities that are related to business, in Belgium. Belgium Visa for Official Visit – for delegations traveling to Belgium on official visits. Belgium Visa for Study Purposes – for those who wish to study at an educational institution in Belgium, for up to three months. Belgium Visa for Cultural, Sports and Film Crews – for people wishing to attend an activity in the cultural or sports field, which takes place in Belgium. What Documents are Required when Applying for a Belgium Schengen Visa? Belgium visa application form. Fully completed, printed and signed at the end. Two identical photos. The photographs should be no older than three months and taken according to the Belgium visa photograph requirements & specifications. Your passport. It should contain at least to blank pages in order to be able to affix the Belgium visa sticker. Check the validity of your passport before you apply, since it must be valid for at least 3 months beyond the date you exit Belgium (Schengen territory). It must be no older than 10 years, as well. Copies of your previous visas (if applicable). Language Preference Form. Belgian authorities offer to you the opportunity to choose in which of the three national languages of Belgium you wish your application to be treated (French, German or Dutch). On the other hand, if you choose to complete the application in English, please choose “no preference”. Schengen Travel Insurance. You are required to submit a document, which confirms that you have purchased travel insurance for Belgium and the whole territory of Schengen, with a minimum €30,000 coverage for medical emergencies, and repatriation in case of death. Learn how to buy travel insurance to meet the Belgium visa requirements. A cover letter. In which you explain why you wish to visit Belgium and you give further details on your trip. Round-trip Flight Itinerary. Containing the dates and flight numbers specifying entry and exit from Belgium (Schengen area). Proof of accommodation. A document that shows where you will stay in Belgium. I.e. Hotel reservation for the whole duration of the intended stay in Belgium. Find and Book Cheap Hotels in Belgium! Proof of civil status. This could be a marriage certificate, birth certificate of children, death certificate of spouse, etc. Proof of sufficient financial means for the period of stay in Belgium. According to the Belgian Immigration Office, a traveler has to attest possessing €95 per day if staying in a hotel, and €45 when planning to get accommodated by cheaper means. Belgium application form signed by both parents. Family court order – in cases where only one parent has full custody over the child. Certified copies of ID / passport of both parents. A notarized parental authorization to travel to Belgium, signed by both parents / guardians if the minor will be travelling alone. *Note: When applying at the Belgian embassy/consulate, the guardian or parent should accompany their under-age children. Depending on the purpose of your visit to Belgium, you will need to meet some additional Belgium visa requirements. Following find the extra required documents you need to submit, based on your reason for traveling to Belgium. A valid visa (if needed) for the final country one is travelling to. The flight ticket for the final country you are travelling to. Bank statement. Preferably for the last 6 months. Travel Itinerary. A detailed description of your trip in Belgium. Make sure to include the purpose of travelling and the intended period of stay (entry / exit dates), as well as any hotel reservations to prove where you will be accommodated while in Belgium. Do not forget to list the places you plan on visiting or activities you will be attending. Proof how you will be financing your trip to Belgium. Bank account statement, if you will be covering all costs by yourself. An original certificate of family composition of the guarantor, issued by his/her municipality in Belgium (no residence certificate). Letter of Invitation. By the relative/friend residing in Belgium attached to their Belgian ID card or Belgian residence permit. Invitation letter from the Belgian company you will be visiting and their details and address, accompanied with the dates of your visit. A certificate from your employer. In this letter should be stated why you will be traveling to Belgium, and that your employer permits you to leave throughout that period. Business bank statement. Preferably for the last 6 months. Memorandum and Article of Association. It should be submitted in original certified copy (registered with joint stock companies). Trade License (first issued and present renewal). Proof of trip financing. Regarding your expenses during your whole stay in Belgium, either the employer or the partner company must state coverage of expenses on the letter or invitation. A local medical report. Issued from a doctor / clinic / hospital in the home country of the visa candidate, that your need medical treatment in Belgium. Proof that you have the sufficient financial means to pay the medical expenses and other related expenses throughout their treatment. Invitation letter from the relevant body in Belgium with details upon the nature of events or activities that are to be held in Belgium. Other documents that present Names of the applicants (crew members) and other relevant information about the event. Proof of previous performances. Participation in previous festivals and ceremonies (cultural, religious), sports competitions, winners certificates, proof of world/international ranking (sports). Proof of Belgian citizenship (ID card or consular card or certification of Belgian nationality or naturalization order). Evidence on the purpose of journey (negotiations, meetings, event by intergovernmental organizations, consultations). Find out where you need to apply for a visa to Belgium. Choose the right Belgium Schengen visa type. Based on the purpose of your travel to Belgium, choose the right visa type to apply for. Collect the required documents for a visa to Belgium. Make sure you collect the right documents for the type of Belgium visa you are applying for and they all comply with the criteria as defined by the Belgian Embassy/Consulate in your country of residence. Make a visa appointment with the Belgium Embassy/Consulate or a Belgium accredited visa application center in your country of residence. Attend the visa interview at the appropriate Belgium Embassy/Consulate/VAC. Who Can Apply for a Schengen Visa at the Belgian Embassy / Consulate / VAC? If Belgium is the only country in the Schengen Area, which you plan to visit, then simply apply at the Belgian embassy / consulate / VAC in your country of residence. You cannot apply for a short-stay Belgian visa from a country in which you are currently on a visa. How Long Does It Take to Get a Belgian Visa? That is why you are highly recommended to apply for your Belgian short-stay visa as soon as you can, but no earlier than three months prior to your trip to Belgium. How Much Does It Cost to Apply for a Belgian Visa? Still, be informed that depending on applicant’s age, nationality and some other factors you could be exempt from paying the Belgium visa fee, or at least you may have to pay a reduced fee. Check the list of the Belgian Schengen Visa fees for more information in this regard! How Long Can We Stay in Belgium Without a Visa? 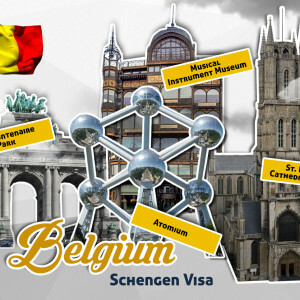 Nationals of countries that are not under the list of Schengen Visa exempt countries cannot enter or stay in Belgium or any other Schengen country without a visa. On the other hand, nationals of a visa-exempt countries, can remain in Belgium for up to 90 days, within a 180 days period. The time spent in other countries within the Schengen Area, is also counted in this period. Please make sure you understand the 90/180 Schengen Visa Rule. Do not violate this rule, not even for one day, since you may face consequences for overstaying in the Schengen territory. Do US Citizens Need a Visa to Visit Belgium? U.S. citizens don’t need to obtain a Belgium visa when traveling to Belgium for up to 90 days for tourism and business purposes. However, US nationals are required to hold a US passport, which should be valid for at least 3 months beyond the period of their stay in Belgium. Can I Extend My Schengen Visa in Belgium? Yes, you can extend your Belgian Schengen visa, but only in exceptional cases where new facts and special reasons arise after entry in Belgium. Please read How to Extend a Visa to Belgium to understand in what circumstances and what are the conditions you must fulfill in order to be eligible to extend your Belgian Schengen Visa. Can My Belgian Schengen Visa Be Revoked? Yes, the relevant Belgian authorities may revoke your visa. The revocation of a visa may happen if the conditions for issuing the visa are no longer met. Failure of the visa holder to provide the border officer with the entry requirements does not cause automatic annulment of a Schengen visa to Belgium. However, it may lead to that. Who needs a Schengen Visa? How to Apply for a Schengen Visa? How to Apply for a Schengen Visa from the United Kingdom? How to Apply for a Schengen Visa from the United States? Copyright © 2012 - 2019 SchengenVisaInfo.com. All Rights Reserved.